It has been four months since I lost my Maggie and I have been struggling to get past the huge void that her passing has left. 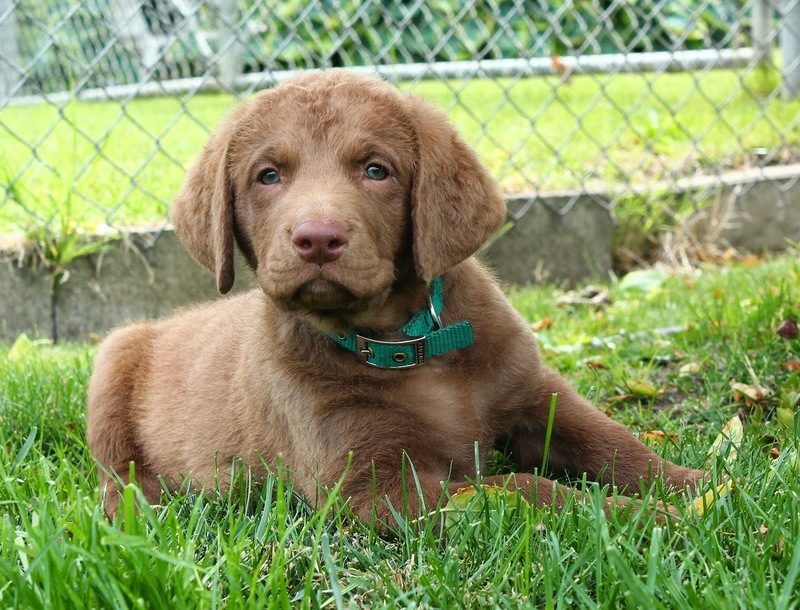 I knew that I wanted to get another Chesapeake to help my heart heal and after a great deal of searching, waiting for the litter to be born, then waiting for the pups to be ready, the day finally arrived. 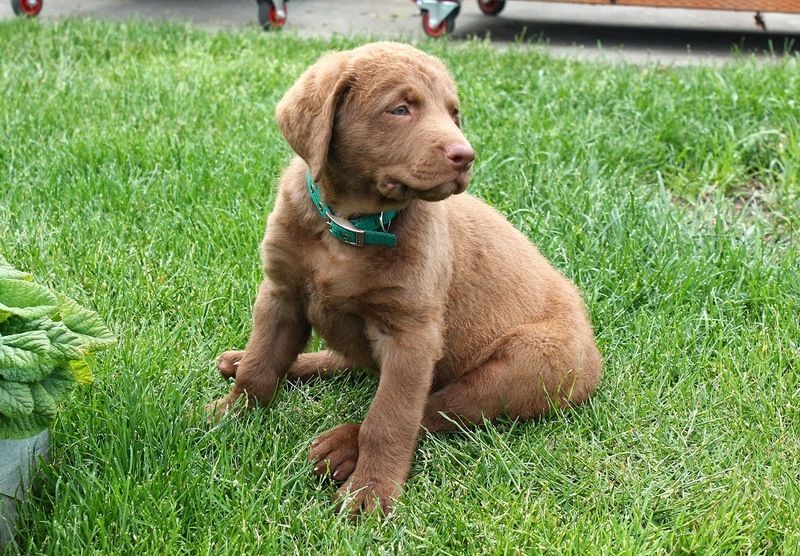 This past weekend we brought home my third Chessie pup, this one from Blue Skies Kennel in Cheney, Wa. I am pleased to introduce the new love of my life, Balin. Oh, my gosh, he is handsome and smart! (I may be slightly biased here) He is 15 lbs. of puppy exuberance and energy and is keeping me running trying to keep up with him. My garden is now on the endangered list as he happily runs through it taste-testing as many plants as he can before I can catch him. He has trampled my beans, shredded my cabbage and totally trashed my iris by pouncing into the center of them and thrashing his way out. He also loves digging in the dirt, rooting through the compost pile and splashing in his wading pool. All this in just four days! Whew! I'm tired and we've only just begun! When he's not terrorizing my garden he can be too cute for words. His next favorite place is in the kitchen either sleeping by his dishes, snuffling around for lost morsels or sitting in the dishes waiting for food to magically appear in them. I'm hoping he's not going to eat me out of house and home, but most Chessies have robust appetites and all my dogs have loved their food. All have gladly helped me out in the garden, too, and it looks like Balin will follow that path as well. A sketch of Balin in a quiet moment. Time to paint will be at a premium for a few weeks as I make the adjustment to having the little guy in my life. Even when Maggie was sick she was still fairly self-sufficient and I didn't have to monitor her constantly. 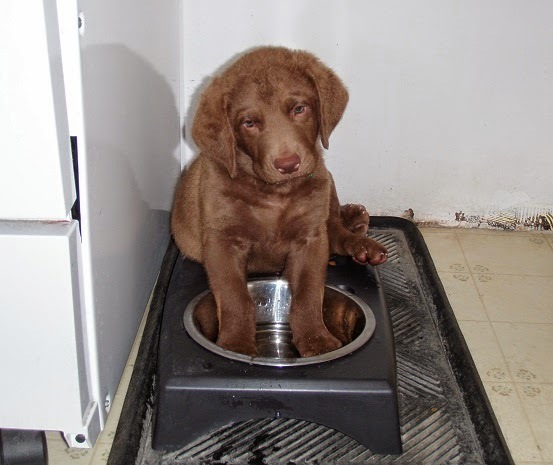 Balin will need lots of supervision for awhile as he grows and learns his boundaries. It's a bittersweet time for me as I embrace the challenge of this new pup and start letting go of my Maggie. I already love him more than I thought I could and my house feels whole again. I look forward to all the good memories I'm going to make with Balin and to the time when I get to create his portrait to hang alongside my two other loves, Jake and Maggie. 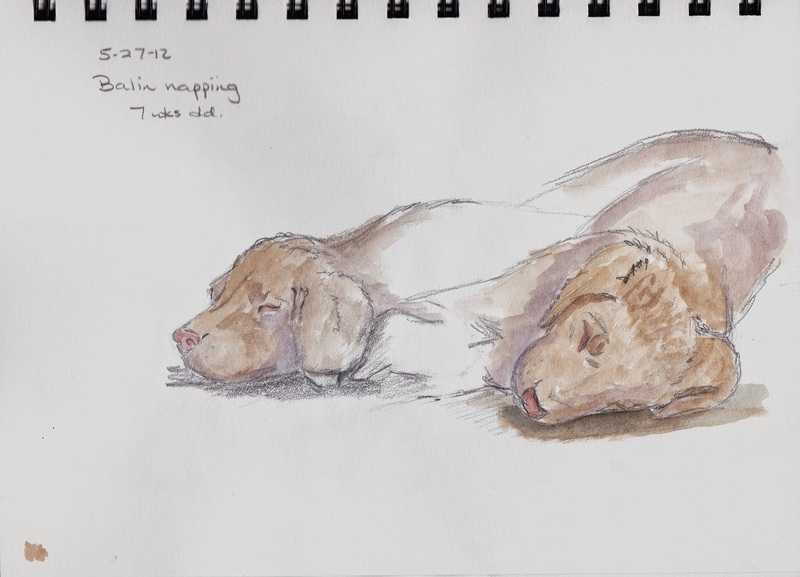 Love the watercolors of your new love Balin. Thanks! Thought I'd better get some artistic impressions down before he grows out of puppyhood. 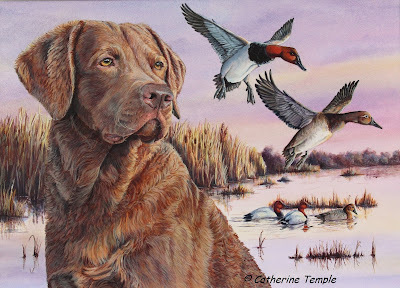 Winner 2017 Delaware Duck Stamp Competition! Catherine lives in eastern Washington with her husband, Brian and her dog, Balin. She is an avid outdoorswoman, nature lover and artist. Her favorite subjects are animals of all kinds, domestic and wild, but especially birds and dogs. She enjoys painting in all water media especially acrylic, watercolor and casein. When she's not painting you can find her in the garden, riding ATVs, or enjoying the outdoors somewhere with sketchbook and camera at hand, stalking the subject of her next painting. Copyright Catherine Temple 2012. All rights reserved. Awesome Inc. theme. Powered by Blogger.